SERIOUS Investing: Now that you think you have the formula for Bursa, what about NYSE and Nasdaq? Now that you think you have the formula for Bursa, what about NYSE and Nasdaq? There was a time where some of the readers were asking about whether to diversify their investments overseas. I said yes. But, let me say this as well. Be prepared to lose some money as overseas market may not be the same as Malaysia. There was once I attended a talk by OSK on investment in Hong Kong in one hotel in KL. I remember seeing thousands of potential investors. 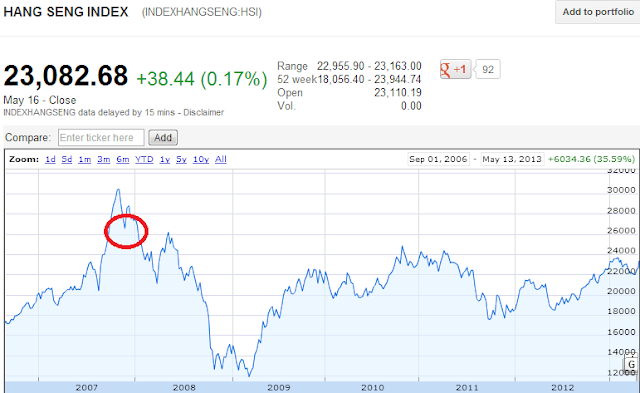 At that time, the HKSE was on the run (uptrend). Hot Chinese stocks like Bank of China, China Life, China Construction Bank were the order of the day. I did not know how many signed up to invest in Hong Kong through OSK Hong Kong. The people whom had attended were probably trying to park their money overseas legally. I was thinking of the same as well. 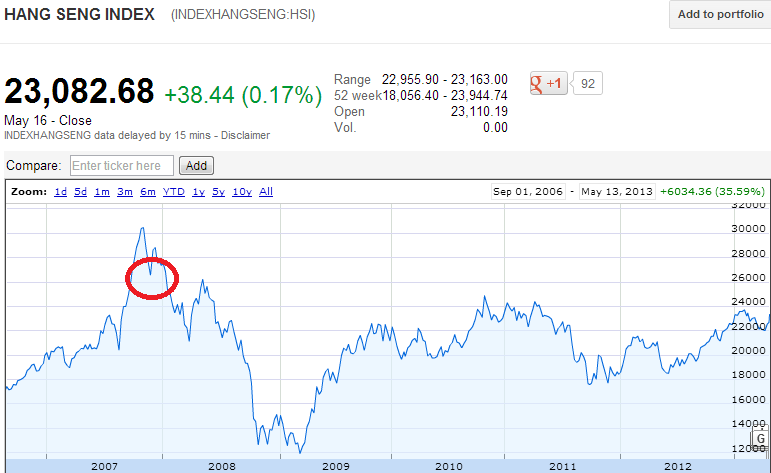 If I can remember, at the point of time the Hang Seng index was almost touching 30,000. It has since came crashing down to about 22,000 despite China did not see any hard landing between then and now. I can see some guys were losing their pants. Now, why do I say this. I can guess that on that talk, OSK probably did some good business signing up lots of people to trade in their brokerage house in Hong Kong. At around the same time, Public Mutual and CIMB introduced the East Asian fund if I can remember. Today, it is below the issue price. This happened to me as well. I thought that I could do well by parking my money in US this time. The NYSE and Nasdaq were very attractive for me having dropped due to the crash post-Lehman. I remember Ford went to around USD2. So was Bank of America. I thought it was opportunity time. It was opportunity time for real. But if this is the first time you are into a new market, be prepared to lose some money or not doing well. New market means new trading patterns. As well as new companies to look at. That's not easy. Remember me always talking about company, company rather than market, market. In US, I was looking at market market - which is proven wrong. Why was I looking at market (i.e. macro level). I do not have that good a feel on the micro level. I thought that I could have known what Wal Mart is doing, or Bank of America, or Citi or GE or Visa. I am partly right. I am not in US trading US stocks. I am doing it from Malaysia. I thought I can know how Gap is doing by looking at Gap Malaysia. So is Starbucks by looking at Starbucks in Malaysia. Not quite right. The feel can be totally wrong. I invested into a company called Monster. It is the equivalent of Jobstreet or Seek - or so I thought. I thought it could have done well (later), despite the bad job market in US. It is not doing well. I invested into Corning whom is the largest glass (screen) supplier for the LCD or the smart phones market like Iphones, Galaxy. It is doing decently well but the stock is not doing that well. Over the last few months, the US market was on the run and now on its all time high. So is my portfolio of stocks in US, but it is not performing very well. It is doing probably just as well as the Dow Jones Industrial Index (Bursa CI equivalent) or the S&P 500 (Emas index equivalent), which is not I wanted. If I would have taken the same amount of cash and put them in Malaysia, there is a high chance would have done much better despite DJIA's trend being better than Bursa over the last 3 years. My strategy in US is different. I would invest into companies that are large being the Fortune 500 because these are the companies that would have presence in Asia or at least I can read much about. In Malaysia, I take a different approach by looking a mid-sized companies most of the time. In investment there is no doubt to me (at least) that looking at the companies would be the answer. Timing the market is a strategy but still you have to know the companies. As an arm chair investor sometimes it may not be enough. Even if we visit the place, I have come across when you do a site visit, obviously the management would do their best to paint a good scenario of the company - who wouldn't? You see even analysts no matter how smart they are can get cheated. Hence, sometimes by relying on what you read may not be enough. That's how hard investment can be - but can be interesting though. Think about it. Now you know why so many funds that have done decently well here (like Pubic Mutual, I think) but failed overseas. I cannot be using me as a benchmark, but market is not just knowing the index, or we thought we know the market situation. Market is knowing your backyard, and the more you know the better it is despite the internet bridging the knowledge divide. Done pretty well for yourself all things considered (ignoring currency conversion issues). You can't really "further" yourself in Bursa. Investing in the US is like studying at Princeton, whilst investing in Bursa, is like studying at MSU. You can also practice more effectively the value investing strategy's expounded by Warren Buffet, Benjamin Graham, Seth Klarman to name a few. They were, after all, developed from the American market. Warren Buffett mentioned you don't need to go thousands of miles away to show your stuff. I agree with him. There are many opportunities in Malaysia and the ASEAN region. If one had invested in Philippine equities a year back, the return would have been about 70%. Despite the currency conversion issues, there is something more important which is how you reclaim the money from overseas country if you died. Many might not think about it and might choose to ignore it but in reality you must face it, unless you are buying the overseas share at local brokerage house. A practical thought for estate planning is to keep regular update of ur asset details accessible to your love one in the event of your passing in the event of a sudden demise.. This is especially crucial for those who have asset all over the world! By decreasing the number of jurisdiction in which u keep your asset in, you will reduce the trouble/cost of your executor in executing your will..
From a practical standpoint, once a grant of probate is out for any commonwealth jurisdiction (e.g. Malaysia), the executor can apply relatively easily to get the grant "resealed" in other commonwealth court (e.g. Australia, Singapore) in order to execute the instruction in the will.. This is something that is not often discussed and can be quiet a nightmare for those left behind if not planned for in advance.. I read about this article recently, thought may be of interest to some though it was out in 2012. Recently there are a lot of property boom up amazingly. But there is a penny property stock L&G is just being stagnant. Would you mind to take a look on it. Especially it has just proposed a iculs proposal. Which I think it is benefit to shareholders a lot. But don't know why not appreciate by most public retailer.